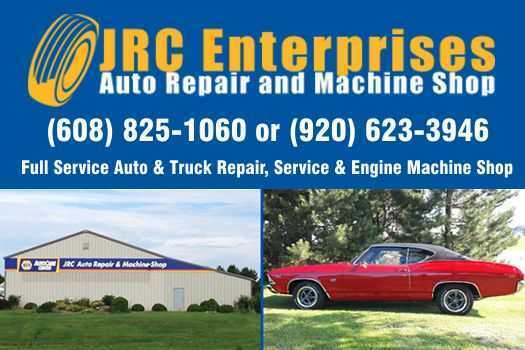 Here at JRC Enterprises Auto Repair and Machine Shop in Columbus, Wisconsin, we specialize in all sorts of auto repairs. We also provide custom car work. From replacing wiper blades to providing you with a complete engine overhaul, we do it all. You can keep your car, truck, or SUV running smoothly without damaging your bank account with regularly scheduled maintenance and oil changes from us. New tires and wheels are available at our shop, and we carry items from most of the major manufacturers. Custom car work is available with prior consultation from one of our technicians. Contact Us in Columbus, Wisconsin, for all your Automotive Repair & Service Needs! Page Summary: JRC Auto Repair and Machine Shop offers auto repair, tires & wheels, wheel alignment, car service and car mechanic. Services such as auto service, muffler repair, truck repair as well as repair shop are also part of the scope of our business. We also specialize in oil change service, auto mechanics in Beaver Dam, Waunakee, Mc Farland as well as Columbus WI. Other areas we serve include Madison, Waupun, Lodi and Sun Prairie. We also service De Forest, Watertown and beyond.